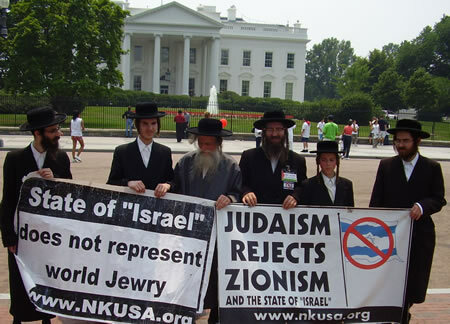 Anti-Zionist Orthodox Jews believe the State of "Israel" does not represent world Jewry and its existence is totally contrary to Jewish Law and teachings. 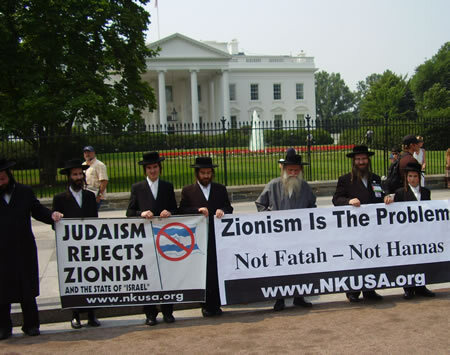 Upon the meeting of President George W. Bush and "Israeli" Prime Minister Olmart, Anti Zionist Orthodox Jews will be demonstrating. At this critical time for the Palestinian people, Mr. Olmart, as representative of the State of "Israel", will be meeting with President Bush. The purpose of this meeting is to advise President Bush on how to deal with the present crisis in Gaza and the West Bank. Peace reigned for all the inhabitants of Palestine and their neighbors, prior to the advent of Zionism and the subsequent creation of the State of "Israel". With the realization of the Zionist ideology and its State, an endless river of bloodshed and suffering has developed. The Torah clearly forbids the formation of a State, for the Jewish people, in their time of exile. The Torah forbids stealing land, subjugating and oppressing a people, etc. Consequently, the State of "Israel" and its representatives clearly do not represent the voice of Judaism and the Jewish people. 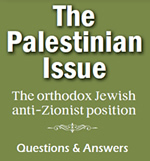 ZIONISM IS THE PROBLEM, NOT FATAH -- NOT HAMAS. The only working solution to a true and lasting peace is the total and peaceful dismantling of this illegitimate State of "Israel" and a transformation to a Palestinian rule over the entire Holy Land. Any other of the countless proposals for peace, whereby the State of "Israel" would continue to exist, is futile. As the Torah states "why are you violating the words of the Almighty, it will not be successful" (Numbers, 14: 41). Our sincere hope to the Almighty is, for this transition from the State of "Israel" to a Palestinian State, to transpire, SPEEDILY AND PEACEFULLY, without any further suffering and bloodshed. Under this new Palestinian rule, we will once again, with the will of the Almighty, be able live side by side, Jew and Arab, in brotherhood.